The year was 1975, VW sales were dropping, VW lost its number one position in sales of import cars in the US in 1974. The new leaders, Japanese auto makers Toyota and Datsun were swarming the U.S. market with little modern econoboxes. Toyota and Datsun’s were cheaper than the famous Beetle, not only that the Beetle was still based on a car first designed by Ferdinand Porsche in 1938. Faced with mounting competition, the Beetle had met it’s fate. The replacement, a small front wheel drive car that was frugal in every way. Introduced in the states as the VW Rabbit it was equipped with a water-cooled 4 cylinder engine with a transversely mounted engine driving the front wheels, the Rabbit was a major departure for VW. VW now had a car to compete head to head with Toyota and Datsun. By 1976 VW was in full swing with marketing campaigns to put the VW Rabbit into the minds of the American buying public. VW effectively launch various campaigns in the 1960’s to show the beetle being used in ways that were essentially not consistent with the use of a small car in the US. If it worked in the 60’s surely it would work again in the 70’s. 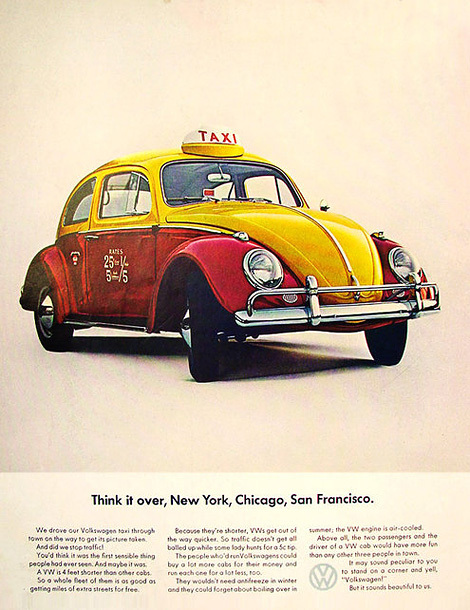 One of the 60’s campaigns demonstrated the Beetle in use as a taxi. The same campaign was dusted off again in the 70’s. The 1977 ad featured Rabbits being used as taxis, under the tag line “they just don’t build Volkwagens like the used to”. The campaign included a press release that showed a Rabbit in service as a cab based out of Kentucky. The press release indicated that Lexington Yellow Cab was using Rabbits. Now I must apologize for the very chezzy title, I could not resist borrowing from the classic novel “A Tale of Two Cities” from the 1859 book written by Charles Dickens. You see, this is a tale about two enterprises that tried to make taxis out of VW Rabbits. 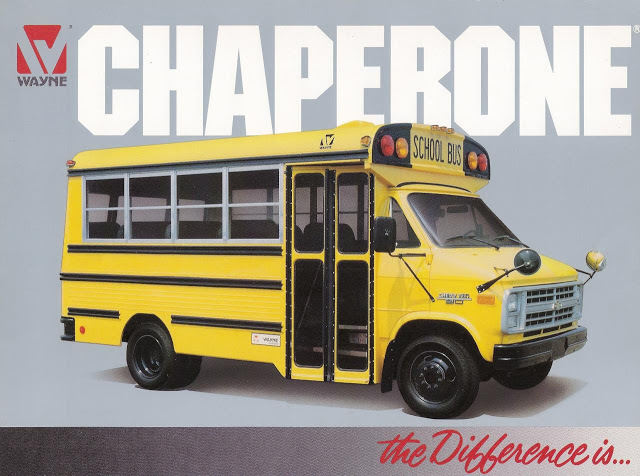 In the 1970’s two companies came up with this brilliant idea: Checker Motors Corporation and Wayne Corporation, both also had the same results. 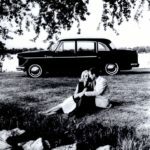 By the mid-seventies Checker would revisit the idea of producing a new Taxi, four years earlier Checker had reviewed a proposal created by Michigan based Auto Dynamics Corp. for a Taxi called the Galva, but for various reasons at the time Checker passed on the proposal and opted to continue to build the old tried and true Checker A11 Taxicab. 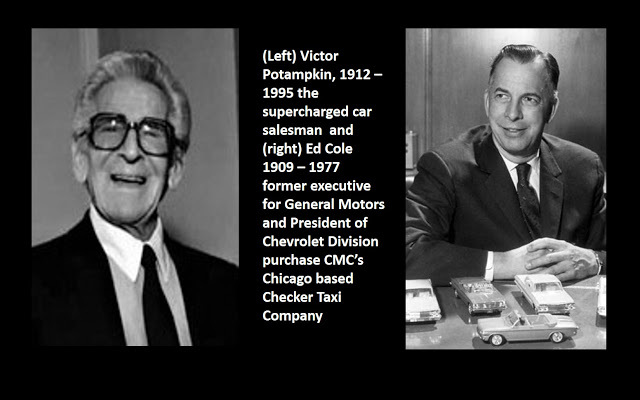 In March of 1977, Ed Cole, former GM president, and Victor Potamkin, one of the largest car dealers in the US, bought control of Checker Motor’s taxi subsidiary: Checker Taxi Co. operated Checker fleets in Chicago, Minneapolis and Pittsburgh. In this role, Cole would also act as the President of Checker and develop new strategies to expand and grow the company. Ed Cole was the former general manager of the Chevrolet Motor Division and president of General Motors. In the early 50’s, Cole was the lead engineer in charge of the development of a new Chevy engine built to replace the Stovebolt Six; this new engine was Chevrolet’s small-block V8, a massive success that remained in production into the twenty first century. Victor Potamkin was a popular New York car salesman who used a combination of sales discounting and aggressive advertising to transform a Manhattan Cadillac agency into the flagship of his $1 billion-a-year automotive empire. Potamkin would also invest in Checker, at the time, Checker generated net income of $274K on $87 million dollars of sales. Clearly, Checker did not have the funds to develop a new taxi on their own. The magic formula of Potamkin’s deep financial pockets along with his sales and marketing know-how combined with Cole’s automotive engineering capabilities and GM connections were the perfect combination required to transform Checker and infuse the company with cash. It was an exciting time at Checker! Expectations were high that the new partners would revitalize Checker’s future, new models would be introduced and the company would grow. At the onset of the transformation was the desire to build a new Checker. Cole and Potamkin partnered with Jim McLernon, President of Volkswagen of America, to explore the feasibility of stretching the VW Rabbit to create a VW based Checker. 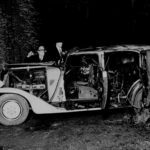 The hoopla was significant; the US automotive world was watching Checker when tragedy struck. Just weeks into the new partnership, Ed Cole was killed in a plane crash while flying his private plane to Kalamazoo. Despite the death of Cole after being with Checker less than three months, Checker soldiered on with the transformation plan devised by Cole and Potamkin. 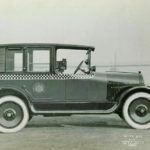 Three months after Coles death in August of 1977, Checker unveiled plans for the new Taxi to the public in a Forbes magazine article. The new Checkers would indeed be based on a stretched Volkswagen Rabbit. The plan was to stretch the Rabbit 21 inches in the rear passenger area. Modifications would be made to the roof in order to improve headroom. To reinforce the overall strength of the Rabbit design, Checker anticipated adding 300 pounds of weight to the body as structural panels, for a total weight of 2300 LBS. The new taxi would use the same VW transmission used in the standard Rabbit. Ed Cole’s plan assumed sales via GM’s dealer network of 50,000 units a year. After his death, Checker CEO David Markin reduced the sales plan downwards to 30,000 units. 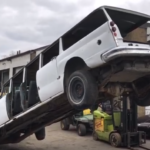 The bodies would be produced by VW and shipped to Kalamazoo for final assembly. One test mule was created and field tested. 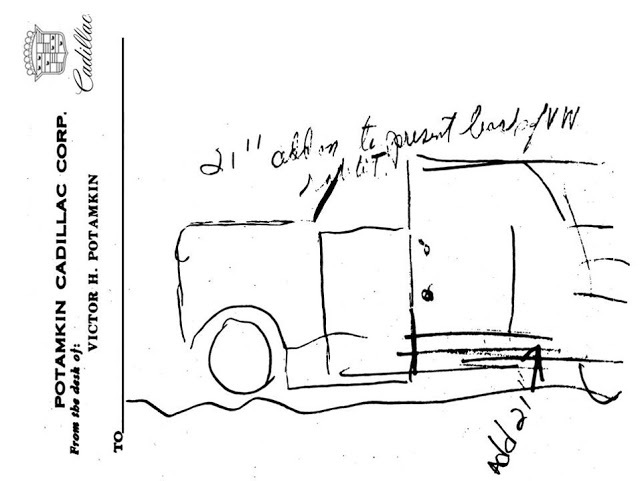 The test encompassed the placement of 500 pounds of sandbags in the rear passenger area of a stretched Rabbit. 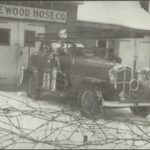 The vehicle was driven from Kalamazoo to Chicago, in Chicago, the test mule was put into loop traffic and monitored for performance, it followed a new Checker A11 Cab used as a control benchmark for the entire test. Both vehicles were monitored and analyzed for the entire exercise. The results of the test were disappointing. Upon its return to Kalamazoo, the mule was parked and the project was killed as it was decided the VW based concept wasn’t suitable as a taxi. 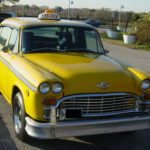 For the rest of the decade, Checker would continue to produce the A11 Taxicab first introduced in 1962. The Cole and Potamkin share to Checker would be repurchased by the Markin family. Wayne corporate heritage dated back to 1837 when the company operated out of Union City, Indiana as the Wayne Wheel Works. Over the course of one hundred and fifty years Wayne was very profitable thus becoming a leading producer of various transportation products. Wayne’s biggest business from the 1950’s till the 1970’s was the production of school buses in North America. Most people reading this newsletter probably rode in Wayne school buses on their way to elementary school as children. Companies don’t last over one hundred years because they stick with the status quo, in the mid 1970’s Wayne started to explore other avenues in the transportation industry. 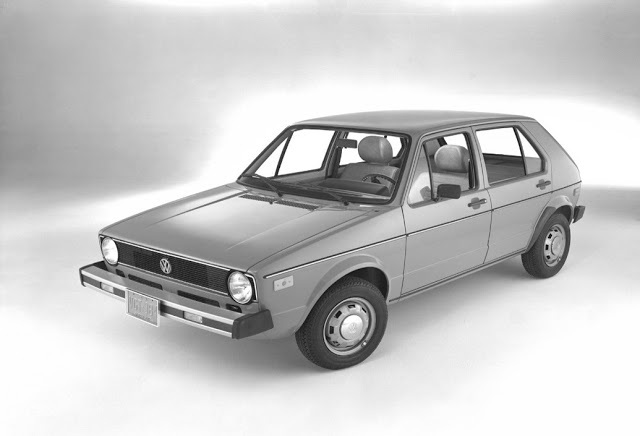 In August of 1977 another VW Rabbit project popped up on to the US automotive scene. Wayne was working on a project call the “Rabbitransit”. 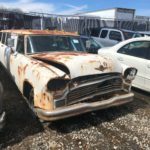 This project was similar in many ways with the Potamkin VW/Checker project. 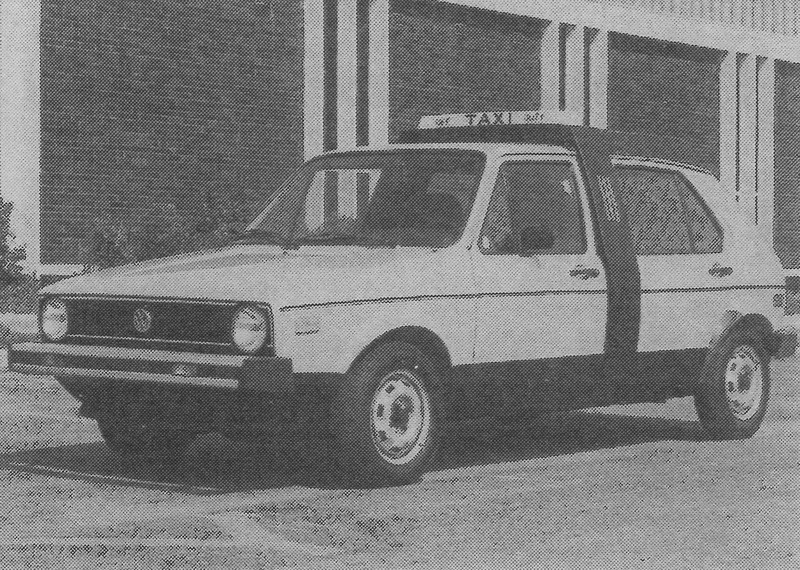 Two months prior to the Forbes article about the Checker VW project, in June of 1977 an article about the Rabbitransit appeared in Automotive News. 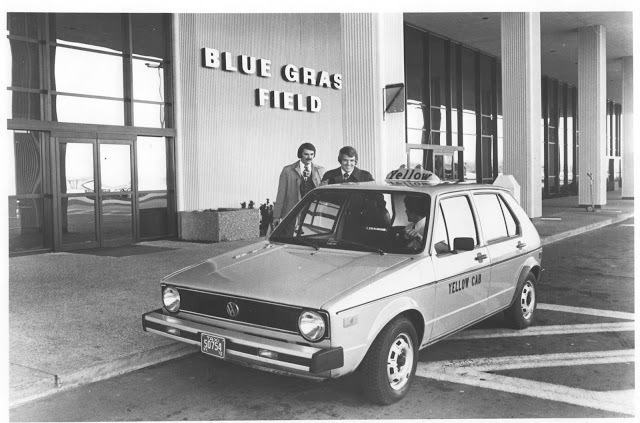 Dwayne Sheilds, president of Wayne Corp came up with the idea of making a VW taxi in late 1977 when he read about several cab companies purchasing a fleet of VW Rabbits for taxi service. His idea was to increase the wheelbase to 104.5 inches, the intent was to seat four people comfortably behind the driver. He also wanted to increase headroom and legroom for passengers. 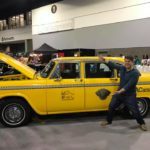 Quoted in Automotive News, Shields said “ in enlarging the car for taxi service, we tried to keep in mind the size of the average American and the frequent need for transportation of luggage, groceries and the like”. Shield expected fuel consumption to be similar to the normal Rabbit EPA rating of 41 MPGs. He also expected to utilize a VW diesel engine to power the little cab. The similar expected EPA ratings were largely based on the fact that Wayne Corp’s Rabbitransit would be 100 LBS heavier than a normal Rabbit. Wayne expect to use light weight vacuum form plastics as body panels and limited steel strainers and bows to increase structural strength. 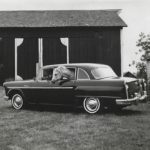 Three prototypes were built, no test information is available to determine their success in testing, but at the time of the writing of the Automotive News article, Wayne Corp. had already decided not to build the car. 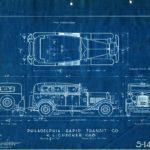 According to Shields, Wayne had already determined that to be cost effective, it was cheaper to make a car from the ground up than to modify an existing car. Additionally VW officials were quoted in the article that “it would be some time before they (VW) would be in the position to supply components for this type of assembly”. Clearly VW was betting on the Checker project. In the end, it seems pretty clear, despite great intentions, VW Rabbits did not make good taxis in North America some 40 years ago. That was 70’s, today in the 21st century that broad statement may not be true. 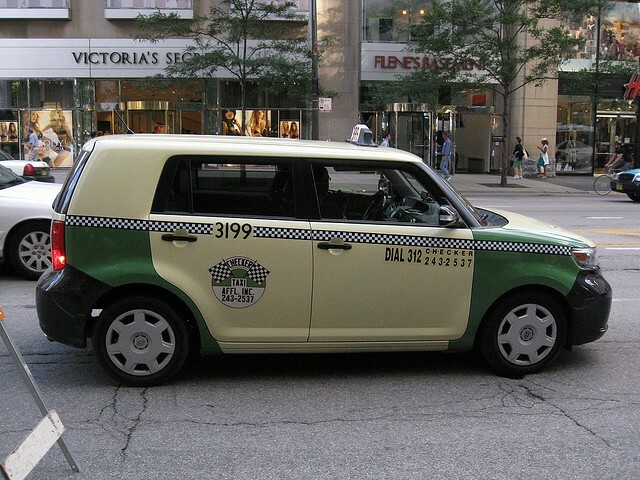 One only has to step out and hail a cab on Michigan Avenue in Chicago today to see the sad state of purpose built cabs in the US. It’s highly likely that when hailing the cab a little Japanese Scion will pull up to the curb, not a substantial North American large Chevrolet or Plymouth. We are all aware of Checker’s demise in 2010. Like Checker, Wayne Corp. shut down in 1997. Wayne was overinvested on bus production and fell prey to Navistar, their largest supplier. Navistar enter the market with their own bus and stole the market from Wayne. Unfortunately for Wayne, they had not diversified and died in the corporate world falling victim of uninvited competition.